The Trello app for Slack links your Trello teams to your Slack teams: Introducing the Trello App for Slack. To make collaboration easier, any non-guest member of the Slack team will be able to join the linked Trello team. This can be controlled via a Trello team setting, if your team has Business Class. For instructions on how to install the Slack App, read Connecting the Trello App for Slack. Trello for Slack is available currently only in English, as Slack only supports English. For an explanation of the Slack scopes we request, read Requested Scopes for the Trello App for Slack. When a link to a team visible card or board is sent in a channel @trello is in it will automatically show you the details and let you perform quick actions. 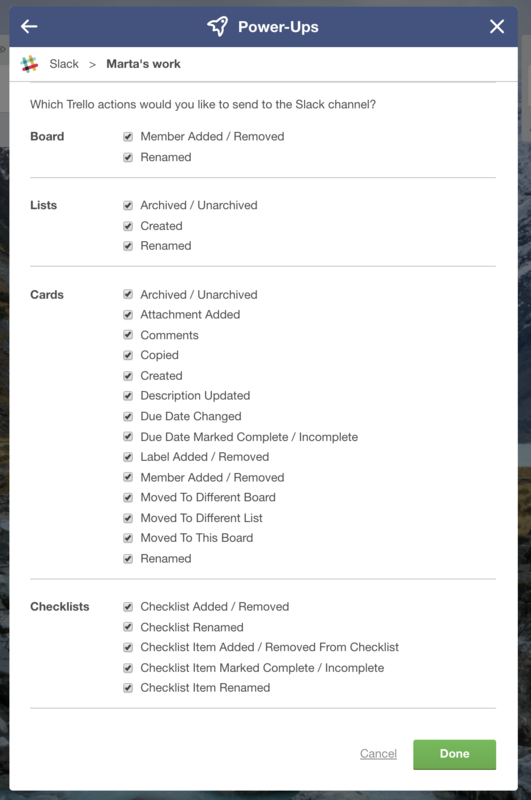 Everyone in the Slack channel will be able to see what the board or card is about even if they do not have a Trello account. @trello will not automatically join any channels on its own. Invite @trello to the channels you want it to expand Trello links in by typing “/invite @trello” without the quotes in those channel(s). Note: For security reasons @trello will only show details for cards and boards that are in the linked Trello team, and are team visible (ie. @trello will not unfurl content on boards that are private). To unfurl content on private boards, you can use the /trello url-to-card-or-board command. 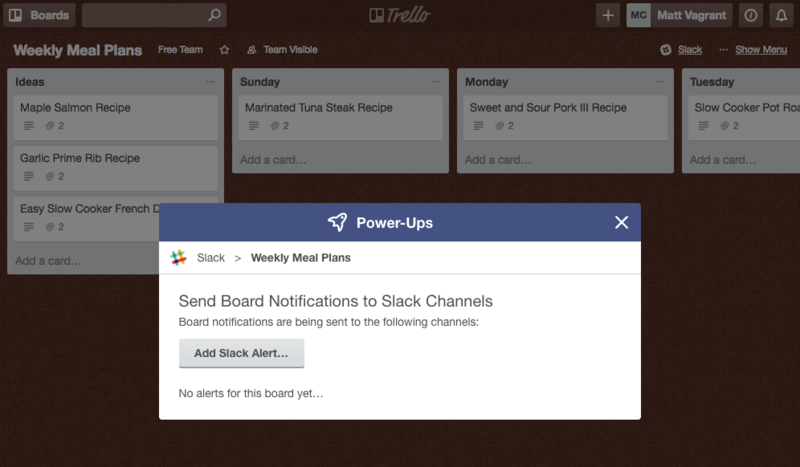 You can get notified in Slack of changes to Trello boards and cards automatically. To do so, enable the Slack Power-Up on the board you are interested in, then click the Slack button that should now be at the top right of the board. 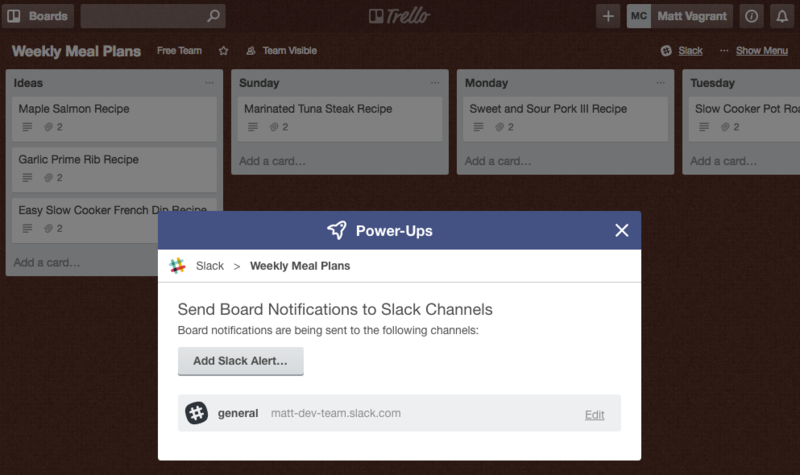 From there you can configure what changes you want to be alerted to and where in Slack. The Slack button will bring up an overlay menu that lets you view and manage Slack Alerts that have been setup for that board. When you click "Add Slack Alert", if you haven't yet authorized with Slack, you will be presented with a button to do so. Don't worry, you can authorize with additional Slack teams later as well. After you have authorized with at least one Slack team, you will be brought to the new Alert setup page. Here you can select which Slack team you want the alerts to go to, which channel (we support channels, private channels, as well as direct messages). Click "Done" to finish and setup the alert. Great work! You can always come back to update or remove this alert at any time. You can add as many alerts as you want to a board. Hi! Here are the commands you can use with Trello. If you need more help you can always reach us with /trello feedback. /trello feedback I love tacos! Note - You have to be an admin of either the Slack team or the linked Trello team to use this command. 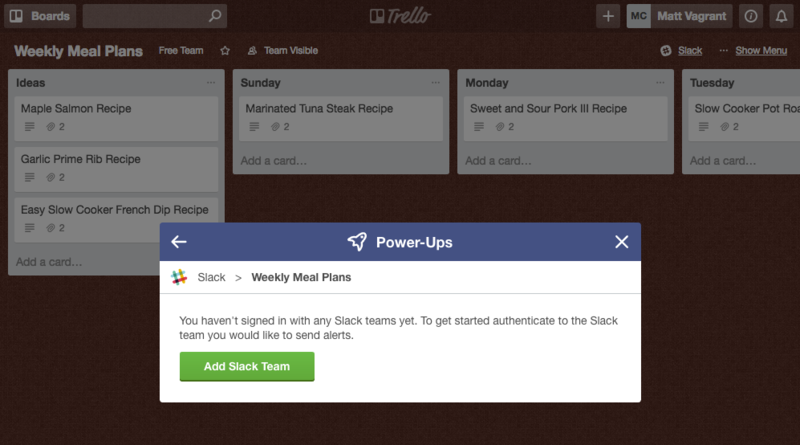 Your entire team will no longer be able to use Trello inside Slack. You will no longer be able to use /trello, buttons or view details of Trello items inside of Slack. Example: /trello comment That’s awesome!